She joined the African National Congress (ANC) in 1952, and in 1954 participated in the establishment of the ANC Women’s League in Cato Manor. Dorothy was one of the leaders of the Women's March to the union buildings in 1956. Dorothy Nomzansi Nyembe was born on the 31st of December 1931 near Dundee in northern KwaZulu-Natal. Her mother, Leeya Basolise Nyembe was the daughter of Chief Ngedee Shezi. Dorothy attended mission schools until Standard Nine, and at the age of fifteen gave birth to her only child. She joined the African National Congress (ANC) in 1952, participating as a volunteer in the Defiance Campaign in Durban and was imprisoned briefly on two occasions. In 1954 she participated in the establishment of the ANC Women’s League in Cato Manor and becoming Chairperson of the "Two Sticks" Branch Committee. She earned a living as a hawker. She was one of the leaders against the removals from Cato Manor in 1956, and also one of the leaders of boycotts of the government controlled beer hall. The beer halls were perceived to destroy traditional beer brewing, the only viable source of income for women in the townships. 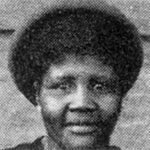 In the same year, Dorothy was elected as Vice-President of the Durban ANC Women’s League and a leading member of the Federation of South African Women. On the 9th of August 1956, she led the Natal contingent of women to the Union Buildings in Pretoria to protest against the introduction of passes for women. In December of that same year she was one of the 156 people arrested and charged with high treason, but the charges against her and sixty others were dropped on 18 December 1957. In 1959 she was elected President of the ANC Women’s League in Natal, and was active in the potato boycott, called in protest against the use and treatment of prison labourers on potato farms in the Transvaal. In 1961, Dorothy was recruited into Umkhonto we Sizwe and worked closely with the likes of Chief Albert Luthuli, Moses Mabhida, Nelson Mandela, Walter Sisulu and Oliver Tambo. In 1962 with the ANC outlawed, Dorothy became President of the Natal Rural Areas Committee where she participated in the organisation of anti-government demonstrations by rural women, including their refusal to fill cattle dips. The campaign became known as the Natal Women’s Revolt. In 1963, Dorothy was arrested and charged with furthering the aims of the banned ANC and she was sentenced to three years’ imprisonment. Following her release in 1966 Dorothy was served with a five-year banning order restricting her to the magisterial district of Durban, however she carried on with her underground activities. In 1968 she was detained with ten others and charged on five counts under the Suppression of Communism Act. In January 1969 she was found guilty of harbouring members of Umkhonto we Sizwe, the military wing of the ANC, and was sentenced to fifteen years’ imprisonment. She was released on 23 March 1984, and become active in the Natal Organisation of Women (NOW), a community organisation fighting against rent increases, transport costs, poor education and lack of child care facilities. Dorothy was awarded the Soviet Union’s greatest awards, the Union of Soviet Socialist Republics (USSR) People’s Friendship Award. In 1992 she was awarded the Chief Albert Luthuli prize for her commitment and dedication to the liberation struggle. In 1994 after the first democratic elections, she was one of the pioneer Members of the National Assembly and one of the founding mothers and fathers of the South African democratic constitution. Dorothy Nyembe may rest in peace now. Dorothy died on the 17 December 1998. "She will rest in peace for she died a day after our heroes whose remains lie strewn along the sacred Ncome River were finally recognised and honoured. She will rest in peace for she knows that the struggle continues and must continue for her colleagues - Florence Mkhize, Tryphina "Mamboxela" Njokweni, Gladys Manzi and Alzina Zondi remain at the helm of the struggle".